His attorneys say the president's remarks about the case could taint a jury pool. 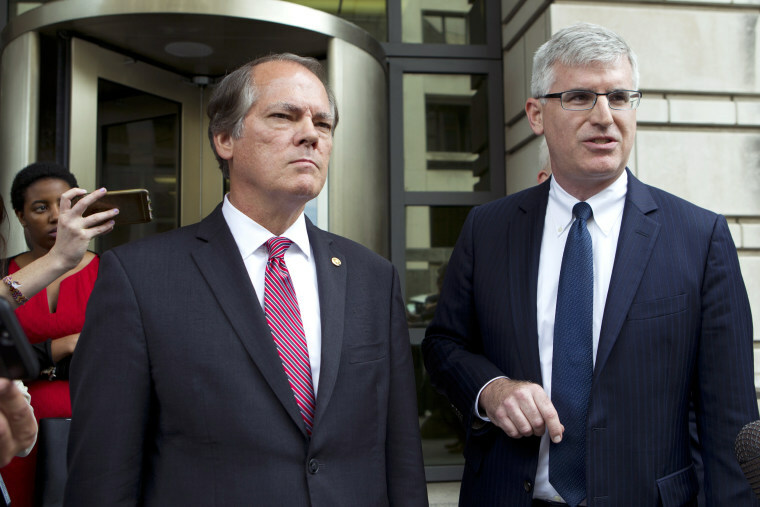 WASHINGTON — A former Senate staffer accused of lying to the FBI about his contacts with reporters will ask a federal court to bar President Donald Trump from making "improper and prejudicial" comments about the case, his attorney said Wednesday. After the brief appearance in federal court in Washington, Wolfe attorney Preston Burton told reporters he planned to file a motion to restrict the president's comments because he was concerned about "glib remarks by the president" that could taint the jury pool and jeopardize Wolfe's right to a fair trial. That apparently was a reference to Trump's remarks earlier this week that Wolfe's was "a very important leaker" and his arrest could be a "terrific thing." "I believe strongly in freedom of the press. I'm a big, big believer in freedom of the press," Trump added. "But I'm also a believer in classified information. It has to remain classified." But as defense attorney Benjamin Klubes said outside court, "there is absolutely no allegation in this case that Mr. Wolfe leaked classified information." The newspaper reported Wednesday that it is now reviewing Watkins' work history, "including the nature of her relationship with Mr. Wolfe, and what she disclosed about it to her prior employers." Media advocates have criticized the Justice Department for going after Watkins' personal communications.